If a driver (other than a taxi driver) is subject to work time requirements, what is the maximum continuous period of work time allowed before a minimum 30-minute break is required? If a driver (other than a taxi driver) is subject to work time requirements, what is the maximum continuous period of work time allowed before a minimum 30-minute break is required? Correct. After working 5.5 hours you must take a break of at least 30 minutes. Work time restrictions are placed on heavy vehicle drivers because driver fatigue is a leading cause of fatal crashes. Commercial drivers are particularly at risk, especially when they drive during shift-work. 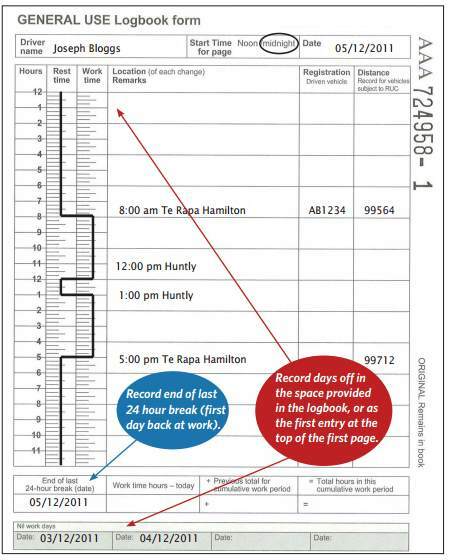 To keep drivers accountable details are stored in a log book, and drivers must take breaks as prescribed. Work time applies to commercial vehicle drivers, including taxi drivers, transport services operators, organisations that employ or contract drivers, and transport logistics companies. Drivers must take a break of at least 30 minutes every 5.5 hours of work time. Work time includes loading and unloading the vehicle, maintaining and cleaning the vehicle, driving the vehicle (including sitting in traffic), and any other administrative duties under paid employment. Taxi drivers may take a break every 7 hours if they have had 1.5 hours of waiting time. In any one 24 hour period (a cumulative work day) a driver can work up to 13 hours before taking a break of at least 10 hours, not including the two standard 30-minute breaks that would have been taken during the 13 hours worked. This gives a total of 24 hours. After 70 hours of accumulated work, a driver must have at least a 24-hour break. The time between each 24-hour rest period is called the cumulative work period. Several cumulative work days will make up one cumulative work period. Employers are responsible to ensure that their drivers are not scheduled to drive so that they would exceed their cumulative work day or cumulative work period. There are scenarios which are out of the driver's control which could cause the work period to be exceeded, for example a civil defence emergency, an incident attended by an emergency service such as a car accident, or urgent action to save life or prevent injury. In these cases you must record them in your logbook (see below), so that you can use them in your defence. In some circumstances drivers of emergency vehicles, including volunteer ambulance and firefighters, can exceed the work time limits if they are attending priority calls. If a driver (other than a taxi driver) is subject to work time requirements, what is the maximum continuous period of work time allowed before a minimum 30-minute break is required? The maximum is 5.5 hours. If a driver is subject to work time requirements, what is the maximum period of work time permitted in any cumulative work day? The maximum period is 13 hours. If a driver is subject to work time requirements, what is the maximum period of work time permitted in any cumulative work period? The maximum is 70 hours. If a driver is subject to work time requirements, what is the minimum continuous period of rest time that must be taken before commencing a new cumulative work day? The minimum is 10 hours. If a driver is subject to work time requirements, what is the minimum continuous rest time to be taken before a new cumulative work period commences? The minimum is 24 hours. If you start work at 8am, the maximum time you can work is 5.5 hours (unless you are a taxi driver). This means that you would have to take a break of at least 30 minutes on or before 1:30pm. If you are a taxi driver then it could be possible to take a break after 7 hours if you have had at least 1.5 hours of waiting, which means your first break would fall due at 3pm. You must keep one logbook, which must have your trip and work details accurately recorded. Failure to do so results in a fine of $2000 and 35 demerit points. The logbook must be retained for 36 months after the date of the last entry. Each logbook entry will have your name, the date the logbook page starts on, the registration number of the vehicle and the start and finish distance recorder readings (if the vehicle you are driving is subject to road user charges), the start and finish times and the location for all your work time hours, and the start and finish times for all your rest breaks and where you took them. Each logbook entry covers one cumulative work period, i.e. the time between two 24-hour breaks. While you are employed as a driver you must deliver a copy of each completed logbook record to your employer within 14 days. Logbooks cost between $7-$20 depending on the number of pages and are available from most stationery shops. Ideally you want an all purpose book that measures mileage, running expenses (to cover your fringe benefit tax obligations and other requirements, triplicate and for it to have enough pages for your requirements. If you work in a really dirty environment, a cover is a good option, too.